The book Cartoon Portraits and Biographical Sketches of Men of the Day collected prose and cartoon works originally published in Once a Week, an illustrated literary magazine in publication from 1859-1880. Cartoon Portraits was published in 1873, but this drawing and its accompanying text originally appeared in an 1872 issue of Once a Week. It follows, then, fast on the heels of Tissot’s Vanity Fair piece. The picture is followed by the caption “SWEETNESS AND LIGHT.” The accompanying text for this caricature is mostly complimentary of Arnold, even though it does suggest that Arnold’s poems will “never likely […] be popular, in a wide sense of the word” primarily because of “their subject-matter and treatment.” Arnold’s poems are, however, complimented as being “full of original thoughts, expressed in the purest English” and are “models of style.” The anonymous author recommends that Arnold will be best known as an essayist and as the “great apostle to the Philistines of this later age, and the preacher of sweetness and light.” Of his essays, the author judges the most remarkable as his lectures on translating Homer and the collection Essays in Criticism, presumably, considering the time that the biographical sketch had to have been written, the first series. Even though the accompanying text is complimentary, the caricature presents Arnold in a mostly negative light and relies on common criticisms about his temperament, commitment to the application of his own ideas, and mental abilities. Arnold’s “disinterestedness” had often been mistaken for “disaffection,” and his frequent lamentations about the conditions of working class men and women, as well as the pitiable conditions many children were living in, were considered disingenuous. One recalls the Vanity Fair caricature’s presentation of Arnold’s face (wearing a vapid smile and gazing off into the distance placidly) when looking at the expression that Waddy gives Arnold in this caricature. Arnold’s eyes are focused on nothing in particular, certainly not on either the audience watching or the trapeze bar he is poised to catch. Moreover, presenting Arnold as an entertainer for posh audiences (note, in the background, the men in top hats as well as the general elegance of the theater) reinforces many criticisms that Arnold was merely performing liberal or progressive “tricks” for the entertainment of the status quo. Finally, poising him between the two trapeze bars leaves Arnold hanging in midair as he jumps between “Poetry” and “Philosophy.” Such a combination of details conveys a common popular judgment against Arnold as the “preacher of sweetness and light” and a commentator of the “kid-glove persuasion.” It is possible that the “LIGHT” of the cartoon’s caption could be visualized by Arnold’s being poised between the two bars, as well. One also must note the discrepancy between the masculine presentation of the face and the feminine presentation of the body. Arnold’s hair (“that perpetual miracle” he once termed it), especially his facial hair, is thick and dark. Such thick side-burns were evidence of one’s masculinity. Christopher Oldstone-Moore’s “The Beard Movement in Victorian Britain” (Victorian Studies 48.1: 7-34) emphasizes the relationship in the Victorian consciousness between masculinity and a man’s facial hair. 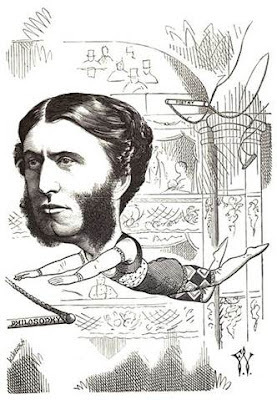 However, the facial hair on Arnold’s enlarged head in this caricature is at great contrast to the smooth lines and tight-fitting clothing of the acrobat costume. Although the arms are stout, the legs are svelte and the feet are pointed, suggesting the artist’s judgment of a discrepancy between Arnold’s masculine ideas and his feminine fear of putting any of them into practice. Perhaps this feminine depiction is emphasizing the “SWEETNESS” element of the caption. Having Arnold presented as a trapeze artist also implies a judgment about his commitment to the application of his own ideas. Flying deftly between “Criticism,” “Poetry,” and “Philosophy,” Arnold is presented as a jack of all trades, but master of none. He is, essentially, fully committed to neither poetry nor philosophy nor, one could surmise, social criticism. Arnold makes no mention of this cartoon, neither its original in Once a Week or the Cartoon Portraits of the following year.